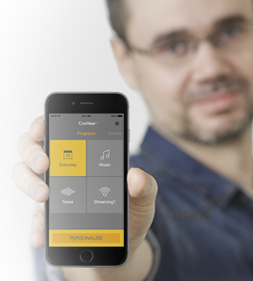 Available for both iOS and Android devices, the Baha 5 Smart App, lets you personalise your listening experience. You can quickly and easily change programs, adjust volume and even play around with the treble and bass. You can save custom settings and get help finding your sound processor if you misplace it. All done via your compatible smartphone. Download it for free from App Store or Google Play. To learn how to pair your sound processor and use the Baha 5 Smart App, watch these videos that will help you make the best out of your hearing experience. Do you have a comment or question regarding the Baha 5 Smart App? Use the contact form to get in touch with us! Psst! Keep an eye out for the Baha Blog Smart Tips – short and sweet reminders of all the unbelievably smart things your Smart App is capable of! Hello I’m trying to connect my Baha to my Android phone. What app do you use? Thank you Eygló for sharing your experience. Please visit http://www.cochlear.com/customer-service for your local Cochlear Customer Service team contact details. The team will be happy to help you. it would be really nice for us android users to have this app also. why is it the iPhone gets it but not android? I called my carrier (Verizon) and asked if it was possible to switch out my existing phone for a iPhone and of course they want me to pay this one off $500 then I can trade it in for $107 towards a new iPhone. Only Apple offers the technology to stream audio directly to a Baha sound processor. To stream sound and take phone calls from an Android phone you need the Cochlear Wireless Phone Clip.